In another week the FOMC will have its final meeting of 2018 and its last with the current mix of policy makers. Already, the discussion has turned to what the Committee will do at that and subsequent meetings: Will it proceed with further 25bp increases in the target range for the federal funds rate, or will it pause? Markets appear to have priced in another rate increase in December, at least as signaled by what has happened to the short end of the Treasury curve, shown in the chart below. Chairman Powell afforded this view credibility in a speech he gave on November 28 in New York. Although the purpose of the speech was to highlight the release of the Fed’s first-ever financial stability report, he did touch on monetary policy. After noting the delicate balance between moving policy rates too fast or too slow to achieve the Fed’s dual mandate and the need to consider information contained in incoming data, he stated that, as far as current policy is concerned, “Interest rates are still low by historical standards, and they remain just below the broad range of estimates of the level that would be neutral for the economy….” What Powell is clearly saying is that he would be comfortable with at least one more rate increase, and this sets the stage for the FOMC’s next move in December. There are two important reasons why the FOMC will move at its next meeting. First, it has provided justification of where rates should be to be “neutral”- that is, neither too tight nor too loose with regards to slowing down or speeding up growth. Second, that justification blunts any perception that the FOMC may be bowing to political pressure from the White House when it comes to setting rates. By saying it is “almost there” and stating that further moves are data-dependent, the FOMC is setting the stage for a possible pause. And the rationale for such a pause will be contained in the Summary of Economic Projections, if the Committee does indeed decide that it has achieved a neutral policy stance. Clearly, world growth is slowing and should the slowing continue that may be sufficient to justify a pause by the Committee. The minutes of the November FOMC meeting, released November 29, reinforce the “almost there” view articulated by Chairman Powell in his speech. The minutes reveal some concern on the part of FOMC participants about the risks to inflation posed by uncertainty concerning the fiscal situation and trade policies. The Committee laid those concerns aside, however, in commenting on the path for policy, and there was agreement that “another increase in the target range for the federal funds rate was likely to be warranted fairly soon if incoming information on labor market and inflation was in line with or stronger than their current expectations.” However, some expressed uncertainty over the timing of further increases, while at least two participants expressed the view that the neutral policy stance had been achieved. 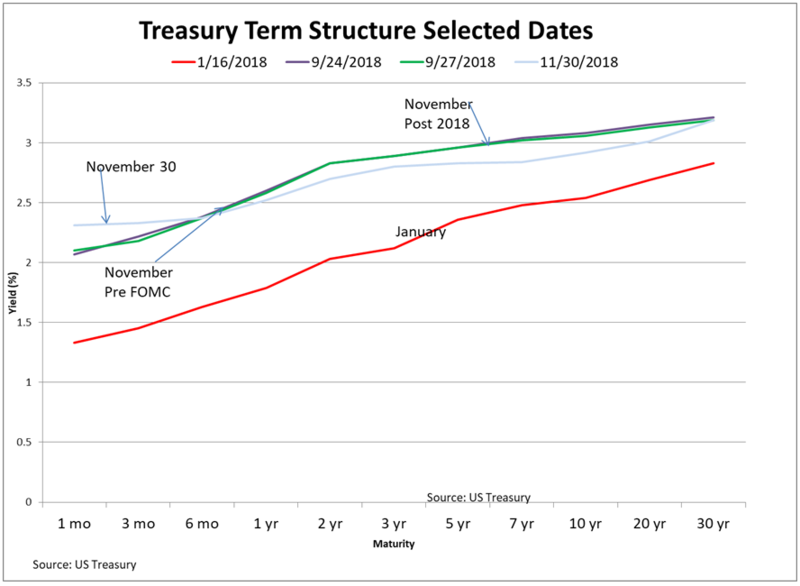 The bottom line is that the minutes, combined with Chairman Powell’s “almost there” hint in his NY speech, perfectly position the FOMC for another rate increase at its December meeting, while preserving flexibility to pause at future meetings and putting some distance between the FOMC and the White House. Chairman Jerome H. Powell, “The Federal Reserve’s Framework for Monitoring Financial Stability,” The Economic Club of New York, New York, November 28, 2018.